If your ever feel helpless when your baby keeps on crying, in the car, when you are travelling for a long journey, you may want to take a look at this iPhone app (also available to iPad) – Best Kids Songs, Stories. This app is developed by Samsung Publishing Ltd and available for free download. My eights months old daughter love this app so much. Whenever she cried due to boring on the road when we travel for a long journey,my wife will play the songs in the apps to keep her calm and so I can concentrate to drive my car. The app bring your baby the magical experience that you can sing along with the music and video. 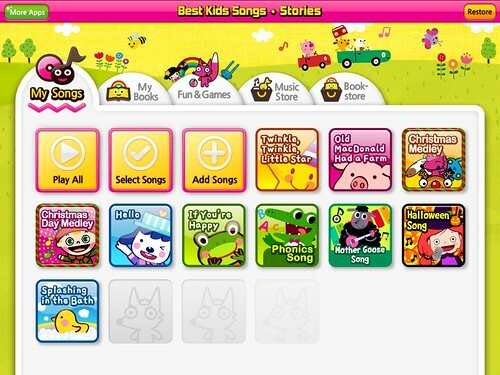 It comes with children’s favorite school song for free and you can buy more songs right inside the app. The free songs are like Twinkle, Twinkle Litter Star, Old MacDonald Had A Farm, Mother Goose Song (my daughter favorite) and a etc. The music videos come with lyrics where your kids can sing along. You can even play it on TV by using Airplay. The videos are in clear and vivid HD with beautiful graphics and adorable characters.